We hear a lot about patent portfolios when we scan our morning dose of tech news stories. Rarely a day passes without news of yet another legal clash between shady lawyers or Silicon Valley behemoths, either settling spats between multinationals or the questionable activities of patent trolls. These huge and well-heeled organisations hold many patents, which they gather either through their staff putting in the hard work to make the inventions, or by acquisition of patents from other inventors. It is not often that a large quantity of patents are amassed by any other means, for example by an individual. There is one prolific individual inventor and holder of many patents though. He achieved notoriety not through his inventions being successful, but through their seeming impracticability while conforming to the rules of the patent system. His name was [Arthur Paul Pedrick], and he was a retired British patent examiner who filed a vast number of eccentric patents from the early 1960s until his death in the mid 1970s, all of which stretched the boundaries of practicality. His subject matter was varied, but included a significant number of transport inventions as well as innovations in the field of energy and nuclear physics. We wish there was room to feature them all on these pages, but sadly they are so numerous that it is difficult even to pick the selection we can show you. So sit down, and enjoy the weird and wonderful world of [Pedrick] innovations. We’ve all seen the social logon pop up boxes. You try to log into some website only to be presented with that pop up box that says, “Log in with Facebook/Twitter/Google”. It’s a nice idea in theory. You can log into many websites by using just one credential. It sounds convenient, but IBM X-Force researchers have recently shown how this can be bad for the security of your accounts. And what’s worse is you are more vulnerable if the service is offered and you are NOT using it. The researcher’s have called their new exploit SpoofedMe. It’s aptly named, considering it allows an attacker to spoof a user of a vulnerable website and log in under that user’s account. So how does it work? The exploit relies on vulnerabilities in both the identity provider (Facebook/Twitter/etc) and the “relying website”. The relying website is whatever website the user is trying to log into using their social media account. The easiest way to describe the vulnerability is to walk through an example. Here we go. Let’s imagine you are an attacker and you want to get into some victim’s Slashdot account. Slashdot allows you to create a local account within their system if you like, or you can log in using your LinkedIn account. Your victim doesn’t actually have a LinkedIn account, they use a local Slashdot account. The first step of your attack would be to create a LinkedIn account using your victim’s email address. This needs to be the same address the victim is using for their local Slashdot account. This is where the first vulnerability comes in. LinkedIn needs to allow the creation of the account without verifying that the email address belongs to you. The second step of the attack is now to attempt to log into Slashdot using your newly created LinkedIn account. This is where the second vulnerability comes in. Some social media services will authenticate you to websites like Slashdot by sending Slashdot your user information. In this case, the key piece of information is your email address. Here’s the third vulnerability. Slashdot sees that your LinkedIn account has the same email address as one of their local users. Slashdot assumes that LinkedIn has verified the account and permits you, the attacker, to log in as that user. You now have access to your victim’s Slashdot account. In another scenario, Slashdot might actually merge the two credentials together into one account. [Pierre Dandumont] just finished up a little project that will give Google Maps’ location feature a run for its money. It’s a technique that spoofs WiFi networks in order to relocate the positional data reported via WiFi networks. He starts with an explanation of the different ways modern devices acquire location data. GPS is the obvious, and mobile network triangulation is pretty well know. But using WiFi networks may be a new trick for you. We’re not 100% certain but we think Google is able to look up location data based on known IP addresses for WiFi access points (this would be a good comments discussion). To trick the system all you have to do is feed some captured AP data into the computer before Google Maps tried to lock onto a location. The video after the break shows Maps with the legit location displayed. After running a quick script whose output is shown above the map position is changed to the spoofed location. Development has been progessing quite nicely on [Matlo’s] PlayStation 3 controller spoofing project. This is a package that allows you to identify a PC as a PS3 controller. We know what you’re thinking: why would you want to do that? When we originally looked in on the project about a year ago we mentioned that this allows you to use any Linux-friendly peripheral as a PS3 controller. In the clip embedded below you’ll see that nothing beats a good keyboard and gaming mouse when it comes to first-person shooters. [Matlo’s] solution not only allows you to use alternative control hardware, but there’s almost unlimited configurability. 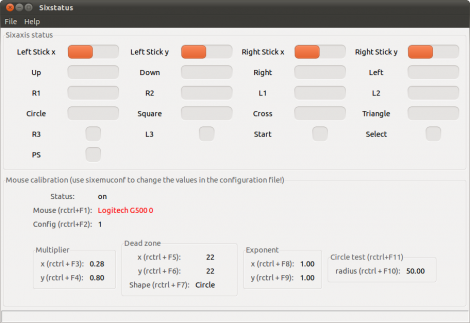 And speaking of configuration, he’s done a ton of work on the GUI. After the initial package installation no terminal typing needs to be done to get the system configured. Once in place, you can set the MAC address of a Bluetooth dongle to spoof the address of your SixAxis controller. From there you can set up the button mapping, calibrate mouse hardware and the like, and even program macros (fantastic). Now go out and pwn everyone at deathmatch now that the PlayStation Network is back up and running. An Arduino, a spent roll of toilet paper, magnet wire, and a few passive components are what’s needed to build this RFID spoofer. It’s quick, dirty, and best of all, simple. However, [SketchSk3tch’s] creation is not an RFID cloner. You must already know the hex code of the tag you want to spoof. That may or may not be as easy as using a separate tag reader. We’ve seen some very simple RFID tag concepts. What we want is a DIY reader that is easy to build from cheap and readily available components. If you’ve got one, make with the details and tip us off about it. 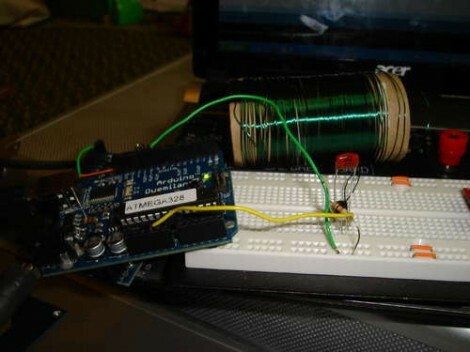 After building a USB magnetic stripe reader, [David Cranor] has found a way to fool a magnetic stripe reader using a hand-wound electromagnet and an iPod. The data on a card is read and stored on a computer, then encoded as a WAV file using a C++ program. The iPod plays the WAV file with the data through a single-stage opamp amplifier connected to the headphone jack. The amplifier is used to drive the electromagnet. Video embedded after the jump. By no means is this a new idea. There have been a lot of mangetic stripe projects and software. This project in particular references the 1992 Phrack article “A Day in the Life of a Flux reversal” by [Count Zero]. Don’t get your hopes up just yet on strolling through high security installations using this little device. It can only replay the data from a card that has been recorded. If you don’t have a known working card, it won’t get you very far.